Demonstrating the wide variety and interoperability of JBL loudspeakers in one of the world’s largest showcases, the Fencing Hall at the National Convention Center in Beijing recently hosted the fencing and modern pentathlon events at the 2008 Summer Olympic Games. This brand new space, located on the Olympic Green, was built specifically for the Olympics. The Fencing Hall features 14 fencing strips, a warm-up room, stands for thousands of fans, a television broadcasting room, and lounge and shower facilities. With the conclusion of the games, the hall will now be converted to a convention hall. There are also numerous features aimed at lowering the environmental impact of the hall including an increase in energy savings and water conservation. The audio system is nothing less than the state of the art, and truly showcases the breadth JBL’s lineup of world-class, industry-leading loudspeakers. The main PA system features six VERTEC® line arrays, each containing six VT4888DP midsize powered line array elements and two VT4882DP powered arrayable subwoofers. The system also includes 400 Control24CT and 300 Control26CT ceiling speakers, along with 130 Control 300 series large-format ceiling speakers. Further bolstering the system are 92 SRX712M stage monitors, 10 VRX915M stage monitors, along with 20 EON15P portable loudspeakers. Additionally, the system includes eight AM4215/64, eight AM4215/95, eight AM6215/64 and four AM6315/64 loudspeakers. Not to be overlooked are eight PD5322/64, two PD5212/64 and three PD5322/43 loudspeakers. The entire audio system will remain intact during the conversion of the hall, although the system can be reconfigured to suit different events. Beyond the massive JBL system, the Fencing Hall is also a showcase for numerous Harman brands, includes a total of 253 Crown CTs amplifiers, two Soundcraft Vi4 consoles, and BSS Soundweb London BLU-80 processors, part of the HiQnet™-enabled London Architect™ system design and control protocol. Hong Kong-based Advanced Communications Equipment (ACE) installed the system. JBL Professional today announced the promotion of Harman Professional veteran, Stephen Morris, to the position of Executive Vice President of Sales, JBL Professional. Morris takes up the position having successfully led group-wide sales and marketing for Harman Professional’s cinema business and prior to that held senior sales and marketing roles at sister company, Crown Audio. Today’s announcement was made by John Carpanini, President, JBL Professional. According to Carpanini, the appointment underscores JBL Professional’s commitment to recognize achievement and promote from within but also to continually improve sales and support operations to provide customers in the professional audio community with the products and services they need to be successful. As Executive Vice President of Sales at JBL Professional, Stephen Morris will be based at JBL Professional’s headquarters in Northridge, California and will direct worldwide sales operations reporting directly to John Carpanini. In his new capacity, Morris will also lead U.S. sales operations for Harman Professional brands AKG, Soundcraft and Studer. Prior to leading the Harman Professional cinema team, Stephen Morris was a 9-year veteran of Crown Audio, where he helped the company achieve consistent growth in the global cinema market and was heavily involved in pioneering the development of the Group’s Digital B-Chain technology. The Harman Music Group today announced the promotion of Reed Grothe as Executive Vice President of Sales & Marketing and the appointment of Harman Professional veteran Buzz Goodwin to the position of Vice President of Domestic MI Sales. According to Rob Urry, President of the Harman Music Group, today’s announcements fortify an already-strong sales and marketing organization and position the group for ambitious sales growth in the months and years ahead. 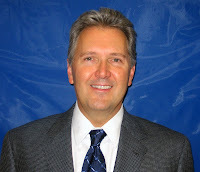 Grothe joined Harman Music Group in January 2007 as Executive Vice President of Sales and was formerly Chief Global Business Development Officer for the Gibson Guitar Corporation. He also held senior sales and business development positions at General Electric Security and Interactive Technologies, Inc. and is a graduate of the Carlson School of Management at the University of Minnesota. Buzz Goodwin is a 20-year veteran of Harman Professional and has proven himself to be a versatile and accomplished sales leader in a number of markets including tour sound, recording and broadcast, systems integration and MI. 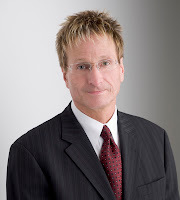 Goodwin’s Harman Professional career began with Lexicon in Massachusetts and he has since held senior executive positions at Harman Music Group, where he led sales operations for BSS, dbx, DigiTech, and Lexicon. 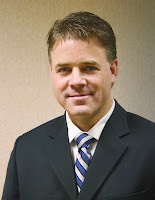 Goodwin rejoins HMG from sister company, JBL Professional, where he led sales operations since 2006. Known for its power, performance and reliability, Crown Audio’s legendary I-Tech Series of amplifiers was selected by Audio Analysts of Colorado Springs, Colorado for Bruce Springsteen’s North American tour. Crown’s I-T4000 and I-T8000 amplifiers were used to power JBL VerTec VT4889 and VT4887 line array elements and JBL VT4880 arrayable subwoofers. Springsteen’s tour began in Hartford, Connecticut on February 28, making 29 stops throughout North America before a 12-country tour in Europe. The tour returned to Springsteen’s home state of New Jersey for three performances at Giants Stadium in East Rutherford on July 27, 28 and 29, where with the help of his fans, Springsteen belted out classics including “Out In The Street”, “No Surrender”, “Thunder Road”, “Born to Run” and “Glory Days.” The final show will take place in Milwaukee, Wisconsin on August 30. “I-Tech amplifiers feature advanced DSP processing which was used for additional adjustment of the JBL line arrays. With the built-in LCD screen on the front panel, basic features and amplifier status can be accessed from the amplifier’s location. Additionally, the added convenience of HiQnet™ networking allows a front of house or monitor engineer to easily monitor an amplifiers status from their location” says Bert Pare, President of Audio Analysts. Soundcraft® Si3 promises to deliver more for less than any other. Currently riding high with tours and engineers thanks to the incredible success of the Vi Series digital consoles, Soundcraft has launched a mid-market partner console in the Soundcraft Si3. This new desk is designed for live use on both touring sound systems and in fixed installations and its intuitive operation and high input and bus count makes it a perfect choice for House of Worship sound systems. Theatre users will also find the Soundcraft Si3 very applicable in their area. What is particularly nice about the Si3 is it all comes in one chassis – console surface, all input and output connections, power supply – so it can literally drop in and replace an existing analogue desk as almost certainly no additional cabling would be required to install it. This compact footprint desk can directly handle 64 mono inputs, 4 stereo inputs and has full connectivity for all 35 output busses (24 Aux/Group, 8 Matrix and Left/Right/Centre mix buses), something you don’t find often on digital consoles at the price level of the Si3. Add to this 4 Lexicon® effects processors, 12 VCA groups, 8 Mute groups and bar graph metering for all 35 bus outputs and you begin to see what a package the Si3 is. So what about the operating surface, is it easy to use? The obvious lack of what is now standard fare on most digital consoles, a large central screen, brings hope that cumbersome centralised channel operation is a thing of the past, and indeed when you look at the controls in detail you see it may well be. Although the Si3 does have a small central touch screen, it is really there for console management, cue-lists, labelling etc. All the normal day-to-day mixing operations are carried out adjacent to the channel faders continuing Soundcraft’s philosophy of ‘where you look is where you control’. An amazingly crisp and bright OLED display clearly shows important channel data for every fader on the desk, while in the centre section, OLEDs provide the same for the output faders. The encoder and OLED displays located in the output section are used primarily for output signal controls such as EQ, dynamics, Matrix contributions etc. but also double up as dedicated controls for the 4 onboard Lexicon processors. But how does it sound? Needless to say with the wealth of experience in digital platform development that Studer and Soundcraft have with the Vista and Soundcraft Vi Series’, the Si3 has inherited the same sound quality pedigree, and coupled with Graham Blyth’s talents in mic pre-amp design and the extensive development of the integral dynamics and gates and Lexicon FX, sound quality is a given. On the rear of this highly-featured console are all the I/O connectors you’ll need. Sixty-four XLR’s for the mic/line inputs, 4 stereo line level inputs, 24 bus output XLR’s, 8 matrix output XLR’s Left/Right/Centre mix output XLR’s, Left/Right/Centre monitor output XLR’s and comprehensive internal and external talkback and Oscillator connections. There are also 8 analogue insert connections which allow outboard processing to be inserted into any input channel output bus. To make preparation of the console setup easier, Soundcraft is also planning to release an off-line editor for the Si3. This self-contained suite runs on a PC or laptop, and allows configuration of the console which can then be downloaded to the desk, saving precious on-site setup time. Just like with the Virtual Vi software for the Soundcraft Vi Series (www.soundcraftdigital.com), engineers can move between different consoles and take their shows and settings with them. Managing to connect a thin bat with a small round ball has been an athletic pursuit for a great many centuries, and it will take on new significance when women’s softball teams from around world converge on Beijing to play in the Olympics Softball event. The large stadium complex, which consists of two ball fields and one training field, with a seating capacity of 13,000 will require sound commensurate with its scale. The sound systems feature two Soundcraft GB4 Series desks at their core. A 32-channel GB4 and a 16-channel GB4 are providing mixing and management for the combined sound systems that comprise of 12 Crown CTs 2000 amplifiers, seven CTs 3000 amplifiers and five Crown CTs 1200 amplifiers driving 64 JBL Application Engineered (AE) Series and Precision Directivity (PD) Series surface-mount loudspeakers with processing by 23 dbx DriveRack 260 processors and two dbx PB48 processors. The GB4 offers a comprehensive array of functions in a small and cost-effective footprint including GB30 mic preamps re-engineered circuit topology and EQ designs, rigid steel chassis and high-quality vertically mounted PCB channel strips. The dual-mode topology allows it to be used for FOH or monitor duties with fader control of group or aux outputs. The Olympics Softball event takes on special meaning in what will be the last time the sport will be seen as an event in the Summer Olympics, - all the more reason to guarantee great sound for the games there, which will be played starting August 12, culminating with the medal finals on August 21. Eight teams will compete in the Olympic softball tournament in a competition consisting of two rounds. Harman Professional’s Chinese distributor, ACE (Advanced Communication Equipment) provided Soundcraft consoles and other Harman brand product information and regional technical support. Wassmann Audio Video And JBL Loudspeakers Blend Audio With Excitement At Multiple Six Flags Theme Parks Across The U.S. Demonstrating the unmatched performance and ease of installation of JBL Control® Contractor loudspeakers and VRX line arrays, Wassmann Audio Video has installed sound systems in 10 Six Flags theme parks across the country. While each location poses its own acoustical challenges, JBL Control 29AV surface-mount loudspeakers and VRX932LA compact line array loudspeakers are prevalent in each park. Located in Whately, MA, Wassmann Audio Video provides design/build solutions for a variety of applications, including houses of worship, educational environments and corporate spaces. The contracts for the numerous Six Flags locations is rooted in Wassmann’s successful work at Six Flags New England, where the company provided sound systems for all the new rides, 11 zones of park paging, four show systems and all the sound for the Island Kingdom water park. KTTV, FOX broadcast affiliate in Los Angeles recently named Bleu Cotton Photography as Southern California’s premier photography studio. According to owner Bleu Cotton, one of the company’s greatest success is attributable to Mitsubishi Electric’s professional photography equipment and Mitsubishi’s quality services. Cotton purchased Mitsubishi’s DPS Click 5000 digital photo processing system over a year ago and has achieved tremendous success with the system. The state-of-the-art DPS Click 5000 takes the hassle out of photo printing, saving retailers and photographers time and money in the process. The unit features a large 17” SXGA menu-driven touch screen, making the photo center easy to navigate and control. Additionally, the DPS Click 5000 provides a full spectrum of photo editing and enhancement features, allowing users to zoom in on specific sections of the image, crop, magnify, enlarge and remove redeye. More advanced features such as color balance, brightness, contrast and saturation are also controllable with just two buttons. For specialty image printing, such as photo holiday cards, birth announcements and business cards, the DPS Click 5000 comes equipped with a set of Aperion frames and borders, allowing the user to easily design and create a personalized announcement for any occasion. Headquartered in Irvine, Calif., Mitsubishi Digital Electronics America, Inc. is a subsidiary of Mitsubishi Electric Corporation of Japan, a worldwide leader in premium quality imaging and presentation products that set the standard in innovation, performance and reliability. The photo imagining division of Mitsubishi Digital Electronics America manufactures and markets a wide range of products for the photographic industry, including an extensive line of digital photo and printer kiosks. For more information on photo products call toll-free 888-307-0388 or visit www.mitsubishi-imaging.com/photo. Few sports test an Olympic athlete the same way that cycling does. It requires maximum strength and endurance for the cyclist to perform at the highest level. At the Beijing 2008 Summer Games, cyclists are competing in the brand-new Laoshan Velodrome, whose sound system is only matched in excellence by the Olympians themselves. Laoshan Velodrome, which will host all cycling during the Olympics, has a capacity of 6,000 spectators. It features a 250-meter oval shaped track and a total surface of 32,920 square meters. Positioned in the arena are the BSS Audio Soundweb Original SW9088iis, one dbx DriveRack 260 control, along with Crown CTS 600 and CTS 1200 amplifiers powering two JBL AC2212/64 and two JBL AM 4315/64 loudspeakers. The system was sold through Hong Kong-based distributor Advanced Communications Equipment (ACE). The Soundweb Original SW9088iis forms the heart of the audio system. In a single rackspace unit, it offers eight analog inputs with comprehensive LED monitoring, eight analog outputs and open architecture signal processing. With application-specific DSP allocation and a fully configurable signal path, Soundweb represents a scalable, networked solution, which can be fully tailored to the installation. A diverse range of control options, including wall controllers, online PC control and third party control systems ensure that the user interface is perfectly matched to the technical proficiency and control requirements of users. 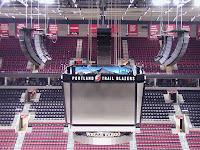 Demonstrating the ease of installation and even dispersion of JBL VLA line arrays, leading audio video products and services provider AVI-SPL oversaw the redesign of the audio system at the Rose Garden, home of the NBA’s Portland Trail Blazers. The new system features six line array clusters of VLA loudspeakers. The redesign of the audio system at the Rose Garden was a part of a major capital improvements project that included a new video scoreboard, powered by a state-of-the-art HD control room. The improvements also included a facelift of the Rose Garden’s main concourses, restaurants, party suites, as well as upgraded LED stats boards and auxiliary scoreboards. 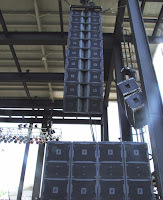 Building on the proven success of the legendary JBL VERTEC® line array series and Precision Directivity® series, VLA (Variable Line Array) series loudspeakers are designed for permanent installations requiring high-impact sound reinforcement at throw distances beyond the reach of traditional loudspeaker designs. The VLA Series includes six large format horn-loaded modules with three horizontal horn coverage patterns (30, 60 and 90 degrees). This modular horn-loaded concept incorporating JBL’s Precision Directivity series technology provides system designers additional flexibility to vary the horizontal pattern within a vertical array. This can be achieved by incorporating different modules with wider or narrower coverage patterns while still maintaining consistent vertical directivity. Bi-coastal team of audio specialists with gear from Firehouse Productions and ATK/Audiotek enable live audio support for global broadcast. 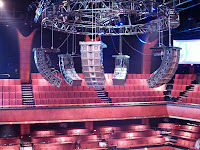 The global adoption of JBL VERTEC® line arrays continues to grow with an international flavor as demonstrated by the specification and use of a full-scale VERTEC system for the 57th Miss Universe 2008 pageant. The event took place at the Crown Convention Centre, located at the scenic Diamond Bay Resort on the coast near Nha Trang City, Vietnam. Dayana Mendoza, Miss Venezuela, was crowned Miss Universe 2008 from a field of 80 hopeful contestants. The pageant was broadcast live by NBC in English and Telemundo in Spanish to more than one billion viewers in over 180 nations. An all-star audio crew from the USA, including A-1 (lead engineer) New York-based Tom Holmes, Los Angeles-based digital console specialist Andrew “Fletch” Fletcher and Firehouse Productions’ system engineer Mark Dittmar, spearheaded the sound system setup, optimization and operation. Staged in a 7,500-seat performance space, the audio system needed to provide precision coverage with sufficient power to be heard throughout the venue, with adequate clarity to meet live broadcast standards. To achieve these goals, the professional audio team turned to VERTEC for the system’s loudspeaker components. For Miss Universe 2008, the sound reinforcement system included a main PA setup of two line arrays, each containing 12 JBL VERTEC VT4889-1 full-size line array elements per side, and a center cluster of six VT4887A compact line array elements. These were enhanced by four JBL SRX728S 2x18” subwoofers per side. The system also featured four VT4887A compact line array elements for front fill. Additionally, the backstage paging system included six JBL EON15 G2 portable loudspeakers. Crown I-Tech 6000 and 4000 amplifiers in custom Firehouse-fabricated electronics racks powered the system, while a dbx DriveRack 4800 loudspeaker management system handled system EQ and signal distribution. All amplification and signal processing functions were remotely controlled and monitored using the Harman HiQnet™ System Architect™ configuration and control software. Taking advantage of the power and flexibility of Crown’s I-Tech Series amplifiers, Sirius Showequipment AG of Niederdorfelden, Germany provided Audio Analysts with over 100 of Crown’s I-Tech amplifiers for use on the Bruce Springsteen tour throughout Europe. The European leg of the 23-stop tour began with three shows in Dublin, Ireland on May 22nd, 23rd and 24th followed by four shows throughout the U.K. The tour continued in Dusseldorf and Hamburg, Germany with a single appearance in Amsterdam in between on June 18th. Antwerp, Belgium; Milan, Italy; Paris, France and Copenhagen, Denmark were all treated to single-night appearances of “The Boss.” The tour continued to Oslo, Norway and Helsinki, Finland before concluding with four nights in three locations in Spain: San Sebastian, Madrid and Barcelona. The tour then returned to the U.S with a 3-night stint in Springsteen’s home state of New Jersey at Giants Stadium in East Rutherford. For the tour, Sirius Showequipment AG used I-Tech 4000 amps for the FOH system to power the JBL VT4889 and VT4887 VerTec line array elements. Additionally, I-Tech 8000 amplifiers were used to power the JBL VT4880 arrayable subwoofer. JBL VERTEC® speakers, Crown I-Tech amplifiers and Soundcraft Vi6 Digital Consoles specified for spectacular event sound system design. In one of the most-watched global media events of the year,the 2008 Summer Olympics opening ceremony in Beijing was held on Friday, August 8 at the newly-constructed Beijing National Stadium (known informally as “The Bird’s Nest”). The Opening Ceremony marked the beginning of the 29th Olympic Summer Games. While the Stadium normally has a capacity of 80,000, an additional 11,000 temporary seats helped accommodate the 91,000 spectators at the ceremony, which lasted nearly four hours, and included four segments: the opening address, artistic performances, entrance of the competing athletes, and lighting of the primary Olympic torch flame inside the stadium. Composer Tan Dun provided the musical score for the event, which featured more than 15,000 performers and was highlighted by Chinese gymnast Li Ning lighting the Olympic torch. Centered around the theme of "Civilization and Harmony," the spectacular performances, including costuming, sets and overall production effects, were designed by Zhang Yimou, the renowned film director, who aimed to convey the "conception of harmony from an international perspective." Leading-edge projection, lighting and mobile sculpture technologies and an entertainment production stage designed by Mark Fisher were an integral part of the technical production, along with extravagant fireworks displays. Sound Media Fusion facilitated the event audio system design, programming and deployment, which prominently featured JBL VERTEC® line arrays, Crown I-Tech amplifiers and Soundcraft Vi6 digital mixing consoles. Gary Hardesty (Chief Designer, Audio- Beijing Olympic Ceremonies Department; Technical Consultant, Panasonic for all Olympic Ceremonies and competition/non-competition venues) had the complex but rewarding task of specifying and implementing the massive, multi-zone, distributed sound reinforcement system approach to integrate portable and installed speaker locations. Numerous Harman HiQnet™-compatible VT4888DP-AN powered midsize line array elements and VT4882DP-AN companion subwoofers with JBL DrivePack® technology were selected to cover various portions of the stadium, including array locations dedicated for use in critical end-zone locations. These were configured as ground-based stacks, each containing two or three enclosures. Arrays were masked with neutral grey weather-protective covers, and many speaker units were installed behind facades and integrated into Hardesty’s overall system design underneath temporary staging platforms, including the 5 Rings Plaza and the National Flags Platform. Additionally, a total of 26 JBL MS-26 ultra-compact fill speakers were dedicated for second tribune and VIP stand fill. Passive speaker systems were powered by Crown I-T6000 and I-T4000 power amplifiers, compatible with hundreds of other Crown amplifiers installed for the venue’s audio system infrastructure. Additionally, Soundcraft Vi6™ digital consoles were part of the event sound system. 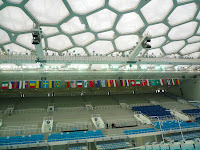 In addition to the high-profile event system for the Opening and Closing ceremonies, Harman products have been specified and installed for more than a dozen Olympic venues in Beijing, Shanghai and Hong Kong, including the National Olympics Conference Center, The National Stadium, National Aquatics Center, and Olympic Sports Center Gymnasium, as well as various fencing, softball and equestrian sports facilities. Sound Media Fusion’s efforts for the Beijing 2008 Summer Olympic Games were assisted by Harman Professional’s Chinese distributor, ACE (Advanced Communication Equipment) whose staff provided JBL and other Harman brand product application information and regional technical support. Duncan Edwards was on hand as a direct assistant to Mr. Hardesty for music programming and system tuning. “The technical collaboration between Gary Hardesty, Duncan Edwards and the entire Chinese team, including Mr. Ma Xin [assistant sound designer to Mr. Hardesty] and Mr. Jin Shao Gang [FOH sound engineer for the opening ceremony], was inspirational to see,” observed ACE’s Bingo Tso. “This teamwork has resulted in a highly successful achievement, the most spectacular sound reinforcement project in the nation to date”. Harman HiQnet is the world's first connectivity and control protocol that integrates all product categories in the signal chain for professional audio systems of all types, size, and applications. Harman HiQnet no longer requires the user to manage multiple disparate operating systems or be responsible for programming individual signal processors, speaker controllers, wireless microphone systems, and mixing consoles. HiQnet was developed by engineers from across the Harman Pro Group and is coordinated by the System Development and Integration Group (SDIG), a team of dedicated systems specialists based in Salt Lake City, Utah. Joel’s world tour began in January 2006 and has been touring ever since. The 2008 segment kicked off in Philadelphia, PA on January 26th, making stops in California, Colorado, Wisconsin, Ohio, Quebec, Louisiana, Connecticut, Virginia and finishing up with two shows in Flushing, NY at Shea Stadium. Joel resumes the second leg of his world tour with dates in Japan, Australia and New Zealand beginning in November. 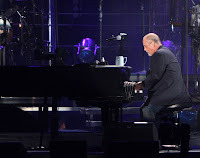 Sound reinforcement for the tour was supplied by Pennsylvania based company Clair Showco, which has had a long relationship with Billy Joel; in fact, many of the tour’s key personnel have worked with Joel for multiple tours, including FOH Engineer Brian Ruggles and Production Manager Bobby Thrasher, who have worked with Joel for over 33 and 27 years respectively, as well as Monitor Engineer Mike Pirich, who has been with Joel for the past 10 years. When looking for a sound console for both FOH and the monitor positions, Clair Showco turned to the Studer Vista 5 SR for its portability, ease of use and sound quality. Pirich added, “As far as quality, it sounds spectacular! It’s got lots of gain and no distortion. We have 30 faders in total consisting of three banks of 10 but are in no way limited by the number of inputs and outputs we can handle. We’ve just pushed 100 inputs feeding 18 stereo mixes and 22 mono mixes but really have more available inputs and outputs than we ever hope to use. Joel’s Keyboardist, David Rosenthal truly relies on the sound quality that he receives in his in-ear mix and with each song, a different monitor mix may be needed. As one of the band members, Rosenthal heavily relies on Pirich and the Vista 5 SR.
Billy Joel’s first show at Shea Stadium on Wednesday, July 16th was originally tagged as the ‘Last Play At Shea.’ However, after the first show sold out so quickly, Joel added a second show and due to the schedule of the Mets, Friday was the date provided. During Wednesday’s concert, celebrity guests included Tony Bennett, John Mayer, John Mellencamp and Don Henley. With this appearance at Shea Stadium, Billy Joel became the only artist to perform at the three major stadiums in the New York area: Giants Stadium, Yankee Stadium and now Shea Stadium. Crown Macro-Tech 3600VZ amplifiers and Clair Showco’s custom JBL-loaded S4 loudspeakers were used for sound reinforcement during the Billy Joel tour. The Studer Vista 5SR is enabled with the Harman Pro Onboard HiQnet™ control protocol. Demonstrating the performance consistency and system reliability of Crown Audio’s CTs Series amplifiers in concert with the efficient network capability of Crown’s IQ Series network cards, Beijing’s new 18,000-seat Wukesong Indoor Stadium, home to the basketball competitions at the 2008 Summer Olympics, features a complement of three Crown CTs600 amplifiers, two CTs1200 amplifiers, two CTs3000 amplifiers networked via seven Crown IQ3-PIP-Lite cards and Harman’s HiQnet™ system configuration and control protocol. The networked amplifiers drive 22 JBL Professional Control 29AV-1 loudspeakers. Situated in Western Beijing, the 63,000-square meter facility was completed in January 2008 and after the Olympic basketball preliminaries and finals will become a major cultural, recreational center for the citizens of Beijing, integrating cultural, sporting and commercial facilities with large-scale gardens and green space. The audio design required engineers to specify and install a system that would sound great despite the resonant surfaces of the large space. Bcause the system would enjoy a second life after the games reliability, scalability and versatility needed to be balanced carefully with the budgetary limitations. Crown’s CTs Series amplifiers provide exceptional performance, flexibility and value for installed sound applications. CTs Series amplifiers feature independent selection of high and low impedance operation for a specific channel, plus power levels and features that were carefully chosen to match the requirements of fixed install design. Crown Audio PIP Lite integrates Ethernet-based network control via 100-Mb TCP/IQ protocol for digital control of analog devices with digital signal control for error trapping, proactive response and remote load monitoring. The Wukesong Indoor Stadium is one of ten venues for the 2008 Summer Olympics games that feature audio systems by Harman Professional. The Beijing National Aquatics Centre, features JBL Professional loudspeakers, a Soundcraft console, Crown amplifiers and BSS Audio processing. Fengtai Softball Field, features Soundcraft consoles, JBL Professional loudspeakers, dbx processing and Crown amplifiers. Many of the same Harman companies are featured 10,000-seat Chang Ping Indoor Arena’s audio system features JBL Professional loudspeakers driven by Crown amplifiers, managed by dbx processing and Soundcraft consoles. The Beijing Foreign Language University Stadium sound system comprises BSS processing, Crown amplifiers, dbx patchbays, Lexicon processors and Soundcraft consoles. In Shanghai, the Shanghai Stadium features JBL loudspeakers, BSS Audio and Lexicon signal processing, Crown microphones and Soundcraft consoles. The Hong Kong Olympic Equestrian Venue is outfitted with JBL Professional loudspeakers and Soundcraft mixers and the Laoshoan Velodrome features JBL loudspeakers, Crown amplifiers, BSS processing and dbx system control. The Olympic Green Convention Centre features Soundcraft consoles, Crown amplifiers, BSS processors and JBL loudspeakers. The Beijing National Stadium is equipped with an awesome array of Crown I-Tech amplifiers. Demonstrating the versatility and power of JBL EON® series loudspeakers, the Hong Kong Olympic Equestrian Venue (Sha Tin) is outfitted with an EON system for the racetrack area during the 2008 Summer Games. While the majority of the Olympic events are taking place in Beijing, the equestrian events are being held in Hong Kong. Managed by the Hong Kong Jockey Club, the venue is equipped with world class facilities, including a 100- x 80-meter all-weather sand area capable of supporting 18,000 spectators and a 5.7 kilometer cross-country course. All three events of the equestrian program, comprising Jumping, Dressage, and Eventing, will be organized at the venue. Additionally, the venue includes air-conditioned stabling for up to 200 horses, an equine clinic, 13 training arenas, a cross-country training track, gallop track, and a bridle path on the Sha Tin racecourse infield. There are four equine cooling stations with misting tents to combat the extreme heat and humidity in Hong Kong. Dispersed throughout the racetrack area are JBL EON series portable loudspeakers. In total, 14 EON10 G2 portable, powered loudspeaker systems have been installed, providing sound to the competitors, media and Olympics officials located on the field. The JBL EON10 G2 loudspeaker features a 10-inch Differential Drive® low-frequency driver, 125-Watt low-frequency and 50-Watt high-frequency (bi-amplified) amplifiers, and a 3-input mini-mixer. Other Harman components at the Hong Kong Olympic Equestrian Venue include six Soundcraft Compact4 mixers and three Compact10 mixers. Demonstrating the premium audio fidelity and rider-friendly characteristics of JBL VERTEC® line arrays, PA Plus Productions recently supplied the live sound reinforcement system for “Songwriters Night,” held at the Avalon Theatre at Fallsview Casino in Niagara Falls, Canada. The shows featured six of Nashville’s most successful country songwriters performing hits they have written for Tim McGraw, Reba McEntire, Faith Hill, Vince Gill and many more. The event showcased the songwriting talents of Al Anderson, Bob DiPiero, Tim Nichols, Jeffrey Steele, Craig Wiseman and Tony Mullins, telling the stories that inspired their most popular songs, followed by all six performing each song together. PA Plus deployed an “in-the-round” setup providing 360 degrees of coverage, with six line arrays each containing eight VERTEC VT4887 compact line array elements. PA Plus also used 16 JBL MS26 compact loudspeakers for front fills. Powered by Crown I-Tech amplifiers, the system was remotely controlled and monitored via the Harman HiQnet™ System Architect™ platform. In addition to the temporary sound system deployed for the “Songwriters Night” event, PA Plus recently installed the permanent sound reinforcement system at the 1,500-seat Avalon Theatre, which includes a left-right configuration of 10 VT4888 midsize line array elements per side, along with six VT4880 arrayable subwoofers per side. Crown I-Tech amplifiers power the new house system, which also includes AKG microphones, BSS Audio DPR dynamics and dbx 162SL compressor/limiters. To read more and to watch the video please click here! With the official opening ceremony of the 2008 Olympic Games, Crown Audio today announced it had provided China’s National Stadium with 400 Crown I-Tech amplifiers to power the sound system during the next 16 days of events at the 2008 Summer Olympic Games being held in Beijing, China. Affectionately known as the Bird’s Nest, the stadium was created by elite design and architectural teams from all over the world. With capacity for 100,000, the stadium will host track and field events as well today’s opening ceremony and closing ceremony of the Beijing Olympics to be held on August 24th. Audio alone takes up two full rooms in the spacious stadium and Crown’s 400 I-Tech amplifiers are housed in 30 racks. The audio system, which is fiber based, was designed by China Broadcast Bureau, a state-run agency. All the processing in the system is being done by the digital console and the robust internal DSP of the Crown I-Tech amplifiers. For an event as important as the Olympics, front panel lockout on the I-Tech ensures that tunings and presets are safely stored and protected from unauthorized users. Remote monitoring and control allow for complete system control from anywhere in the Olympic Stadium. “Our ability to provide world-class network control and monitoring via HiQnet technology was instrumental in the decision to use I-Tech amplifiers in this job,” notes Kellom. Anyone who has ever witnessed or participated in an indoor swimming competition knows that acoustics play a significant part in the experience. Too reverberant and announcements become unintelligible; too sterile and the excitement and sense of place is diminished. JBL Professional Precision Directivity™ (PD) Series and Application Engineered™ (AE) Series loudspeakers are on the job at the 2008 Olympic Summer Games in the National Aquatic Centre in Beijing, to make certain that the sound will be exactly what it needs to be for the array of Olympic games taking place there August 8-24 this summer. The National Aquatic Centre, also known as the “Water Cube,” features 52 PD5212/64 12-inch 2-way full-range loudspeakers, eight PD5122 dual 12-inch low-frequency loudspeakers, 12 AC2212/95, and 12 each 2380A 90- x 40-degree horns matched with 2446J 2-inch exit (4-inch voice coil) compression drivers. JBL's PD Series uses a full range, full bandwidth total system approach that allows contractors and consultants to design a fully integrated sound system that solves the audio challenges inherent to large installations. The AE Series loudspeakers provide a wide variety of building blocks for system design, stair-stepped to give the right solution for any installation. The "AC” models are compact loudspeakers that fit in areas where a smaller profile is required. Designed by the China State Construction Engineering Corporation with a steel space frame clad with ETFE pillows, the National Aquatic Centre was purpose-built for the 2008 Summer Olympics and is one of the best-designed examples of an aquatic competition venue, with its acoustics specially tempered for the occasion. But with literally hundreds of microphones from scores of broadcasters globally relying on the sound system for both information and background sound, the performance of the venue’s PA system is critical. The JBL loudspeakers are joined at the National Aquatic Centre by other industry-leading products from Harman including Crown CTs600, CTs1200, CTs2000, and CTs3000 amplifiers, Soundcraft consoles and BSS DSP utilizing HiQnet™ London Architect™ platform for control. Underscoring the continued adoption of JBL VERTEC® line arrays by leading regional rental and touring sound firms, Proshow Systems recently added a large VERTEC system to its inventory. Proshow Systems has already provided VERTEC for numerous events throughout the southeast United States during the summer festival season. With locations in Memphis, Tennessee and Birmingham, Alabama, Proshow Systems is a full-service, live entertainment production company that has served the entertainment industry since 1989. The company specializes in complete technical productions including audio, lighting, backline and crew service. “We strive to ensure that every event runs smoothly and on schedule, while providing a flawless show for each and every audience member,” said Michael Faber, Director of Purchasing for Proshow Systems. With this in mind, for 2008 Proshow bolstered its inventory with VERTEC, purchasing 32 VT4888 midsize line array elements and 16 VT4880A arrayable subwoofers. Proshow also purchased 22 VRX915M portable stage monitors. The entire VERTEC system was recently put to the test at the 2008 Schaeffer Eye Center Crawfish Boil in downtown Birmingham. The 2-day outdoor event featured performances by 3 Doors Down, Fergie, Gavin DeGraw and Seether. Proshow’s onsite team included Brendan Hines (Crew Chief and House Engineer), Jason Baker (Monitor Engineer) and Adam Edmonds (Stage Tech). For more information on Proshow Systems, please visit www.proshowsystems.com or call 901.372.0550.